This place is ABSOLUTELY wonderful. You will leave wishing you could stay longer! The house is a beautiful cabin, the rooms large and spacious, and the views from the wrap around deck are breath-taking. The breakfast is phenomenal. They hosts really make you feel at home and comfortable. It is a great getaway spot for couples or small groups of travelers. It is only a short 10 minute drive from Sequoia, and on the drive you notice that you are staying in one of the nicest lodges outside of Sequoia. There is no where else I would rather stay when I go to Sequoia than here. My wife and I had a wonderful weekend at the Log House. The food was amazing, the beds were comfortable, and the view from the deck was majestic and calming. I could literally sit out there all day and read a book or just listen to music. What is more, the conversation and fellowship to be had is such a comfort to the soul, and the classic movies played nightly are a fun and relaxing treat. We honestly have no negative comments about this place, and would love to return as soon as the opportunity affords. This is a beautifully situated and decorated lodge that is like no other. Wonderful accomodations, breathtaking views, outstanding hospitality, and delicious meals were ours. We highly reccommend this B&B! "Two Brits wandering around saying 'Awesome!' 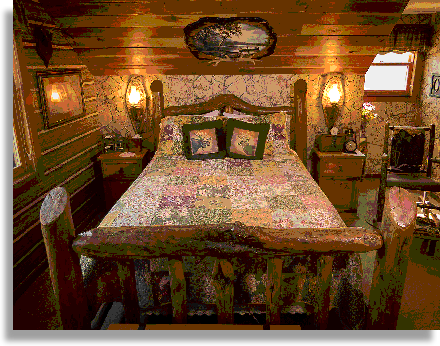 "
We thoroughly enjoyed our three night stay at The Log House Lodge. Everything about our trip was great--lovely hosts, charming home, cozy room (we stayed in the High Sierra room), and awesome setting at the gateway to the Sequoia National Park. 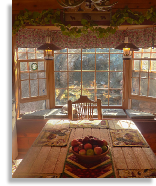 Be sure to spend a day up at the Giant Sequoias, enjoy reading or talking on the deck in the mornings, and of course, don't miss Mauriene's awesome breakfasts. Tim and Mauriene have placed much thought into every detail of their home. We highly recommend this B&B for anyone desiring a relaxing, low-stress getaway! Everything about this place was great-- the views, the rooms, the host, the hospitatlity, the food, the porch and the peace and quiet. What a fabulous place to relax and unwind. Truly a wonderful stay- feels like coming home! It was such a treat to get away from the rat race and really relax... the old fashion way... beautiful surroundings, wonderfully charming lodge and equally charming and gracious innkeepers. My kids LOVED the old tire swing - I loved sitting on the porch hearing them laugh... oh and the National Park nearby is pretty cool too!